Another good one. Thanks for all the museum links Milspec. Keep 'em coming. Here are some pics from the vmmv open house that my friend took and was kind enough to share with everyone. Russian re-enactors w/ a T34/85 and German re-enactors w/ a Hetzer. The bottom pic is an M113 APC. M1910 equipment for reference. M1917 helmet and M1912 and M1916 .45 cal holsters. More M1910 equipment. Plus M1897 trench shotgun, M1903 springfield rifle, and M1918 BAR and two version of the M1917 .45cal revolver one by colt and the other by smith and wesson. Wow very nice. Are the web gear repros? They look mint and in pristine condition for originals. , maybe the holsters too. Here are a couple of more pics from the last VMMV open house. There seems to be no news of any upcoming events. These are some of the Vehicles that were used for the movie "Flags of Our Father's". Don and I were able to make it to the VMMV open house this weekend despite the inhospitable weather. It was cold and rainy. We had an extra Scout with us. His name is Jay. We met a lot of great people and had a lot of fun. Most of the people recognized us as Philippine Scouts. There was the occasional Pearl Harbor or Wake Island defender. But everybody was within the ballpark. The kids enjoyed looking at our gear and weapons. We met Bruce who was the volunteer coordinator for the VMMV and there might be a chance that they can help out Don with his documentary. We also met Gunny who is the coordinator for the US Marine Corps Heritage Center. They held a Vietnam War reenactment of US Marines making an assault on a VC bunker. He also educated us on the M2 60mm mortar. I hope you enjoy the pictures. Photos courtesy of Jay. Great pics Guys! Another opportunity to represent the scouts! Thank you to Jay for joining. Hope your group their grows. I hope they can help Don out with the Stuart tank for the documentary. Wish you guys were there with us. There was a lot inquiries about the group. I got an e-mail from Les, one of the Vietnam Marine reenactors, giving us a lead on a WWII weekend event in Virginia. By the way the Gunny's name is Gy. Sgt. Thomas E. Williams and he is the director of the United States Marine Corps Historical Company and would you believe it, he has great interest in the 26th Cavalry. He is very knowledgeable about various cavalry saddles and equipment. For those of you who don't know Marilou is Don's wife. We met Joe who is from Macabebe Pampanga and works for General Dynamics. More great pics guys! Yes tell the Sgt. Williams about our forum so we can inform him more about the 26th cav's history. Milspec need to tan dye that chinstrap more. Can Jay attend Reading next year as a PS? Vol I, Issue 2 - "What Were They Thinking and Saying"
A friend e-mailed me this pictures of a gaggle of M3 Stuart Tank hulks that are currently in England and is believed to be for sale. The origins of the hulks is not know but a white circle in the turrets with possible small stars might indicate that they were previously in the service of the Brazilian Armored Corps which received M3 Stuarts from the Americans. Don't you wish we could get one to restore. Here are some photos of M3 Stuart hulks In England. 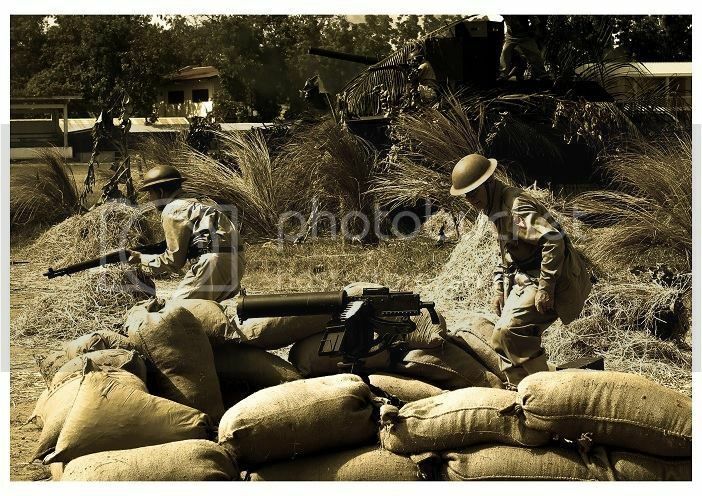 Incredible pics, like discovering a warehouse of forgotten vintage equipment, rifles, mg's, Jeeps! I'm sure the earlier models will be bought fast. It's like all this aid by the US still remains and exists there. ours all ended up stripped by the "mangbabakal". Ray and I were just talking about all the armor and military equipment running around England. Thaks for showing Milspec. BTW great pics you've posted. Here is the story of the Stuarts. My friend sent me a link. Mike Stallwood of Kent based MV specialists, RR Services Ltd, has brought 16 WW2 Stuart tanks into the country and they are selling well to wealthy collectors looking for somewhere to put their money. You would think that, 63 years after the end of the conflict, the chances of discovering a large cache of WW2 military vehicles - let alone tanks - in reasonably good condition would be virtually zero. But that is exactly what Mike Stallwood of RR Motor Services has done. Almost single-handedly he has extracted 16 M3 Stuart light tanks from the wilds of Brazil, and brought them to the UK. The tanks formed part of a consignment gifted to Brazil by the US Army between 1942 and 1945. Some 30 years ago, 40 of those remaining were sold as surplus to a Brazilian businessman who, although there wasn’t the interest in vintage military vehicles that there is now (and none at all in Brazil), recognised their potential as historical artefacts. In the intervening years, some were disposed of but, in September 2007, Mike received a tip-off that there might be a sizeable number left. Within 10 days, he was on a plane to Brazil. There he discovered, on a remote ranch some 125 miles (200km) north of São Paulo, an armour eldorado. On the spot, Mike committed to purchasing every tank that was still available, five M3s with nine-cylinder radial Guiberson diesel engines - which are very rare, only 1285 were manufactured - and 11 M3A1s with seven-cylinder Continental radial engines. But shaking hands on the deal is one thing, getting the tanks back to the UK is another. The folio of mandatory notarised and legalised paperwork was a full ¼-inch thick and took almost a year to complete! And then came the logistic nightmare of actually moving the tanks. Mike is nothing if not hands on and, in August 2008, flew out to Brazil with nothing in his luggage except loading straps and chains. There, in conditions that would give a UK health and safety person a fit, and with the help of a couple of farm labourers, a hired teleporter, much sweat and not a little blood, he loaded the 16 tanks (each of which weighs around 14 tons) plus 60 tons of associated spares into 10 containers. Which brings us to the question of sales. Mike hasn’t yet finished adding up the total cost, but the first few will go to preferred customers who have already put down deposits. Certainly he is under no particular pressure to dispose of anything, and makes it abundantly clear that a falling economy will not lead to bargain basement prices. Indeed, he would like to hold on to a few and is quite taken by the idea of restoring one to driving condition, but leaving the exterior as is. ‘By the time the serious collectors and museums have had their pick,’ Mike concludes, ‘there won’t be that many available to sell. I can foresee already that I’m not going to have difficultly selling as many as I need to sell, and I’m inclined to wait and see what happens with the rest. After all, this is the single, largest outright purchase I have ever made and, without a shadow of a doubt, the most interesting, challenging, and stimulating. I’m in no hurry’. Read the full story by John in the December issue of Classic Military Vehicle magazine. I'm not sure if you guys have seen these pictures but here are some shots of M-3 Stuarts in the Philippines.